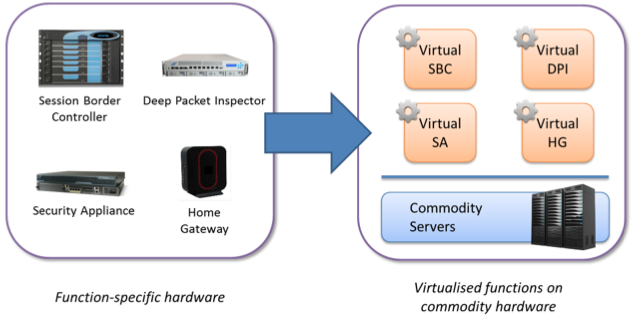 Network Functions Virtualisation (NFV) is an emerging concept. It refers to the migration of certain network functionalities, traditionally performed by hardware elements, to virtualized IT infrastructures, where they are deployed as software components. NFV leverages commodity servers and storage, including cloud platforms, to enable rapid deployment, reconfiguration and elastic scaling of network functionalities. 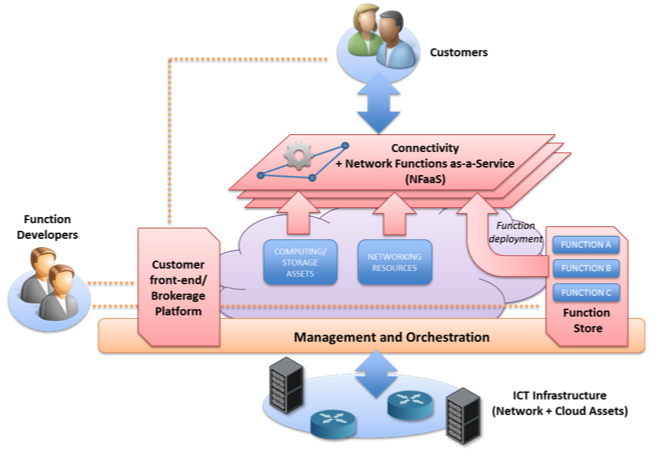 T-NOVA will design and implement a management/orchestration platform for the automated provision, configuration, monitoring and optimization of Network Functions-as-a-Service (NFaaS) over virtualised Network/IT infrastructures. T-NOVA leverages and enhances cloud management architectures for the elastic provision and (re-) allocation of IT resources assigned to the hosting of Network Functions. It also exploits and extends Software Defined Networking platforms for efficient management of the network infrastructure. Furthermore, in order to facilitate the involvement of diverse actors in the NFV scene and attract new market entrants, T-NOVA establishes a “NFV Marketplace”, where network services and functions by several developers can be published and brokered/traded. Via the Marketplace, customers can browse and select the services and virtual appliances which best match their needs, as well as negotiate the associated SLAs and be charged under various billing models. This entry was posted in Projects and tagged T-NOVA by TMB. Bookmark the permalink.